These are the first two trucks that Rutter’s Dairy bought. The one on the left is a 1934 Diamond T and the one on the right is a 1933 Diamond T.
This is a refurbished 1939 Diamond T chassis that I would like to fabricate and install a body like the ones that were on Rutter’s first two trucks. Rutter Bros. Dairy was founded in 1921 by Bud Rutter. Horses and spring-board wagons were first used to deliver milk. Lehman Crist, my Dad, joined Bud and George Rutter in the business on October 30, 1929. Lehman used his 1927 Chevy 2 door sedan family car to deliver his milk route. In 1933 Rutters bought a new 1933 Diamond-T 1-1/2 ton cab and chassis. 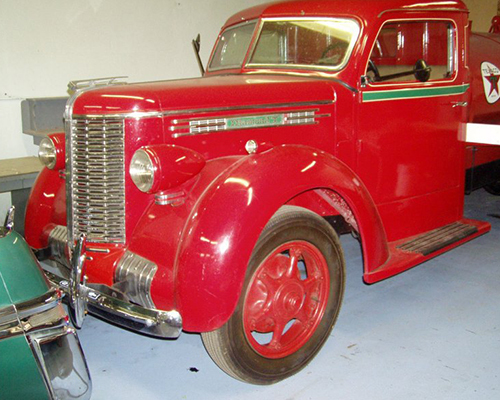 They designed a body for this cab and chassis truck and had York Hoover Body Company manufacture and mount this special body onto the 1933 Diamond-T. 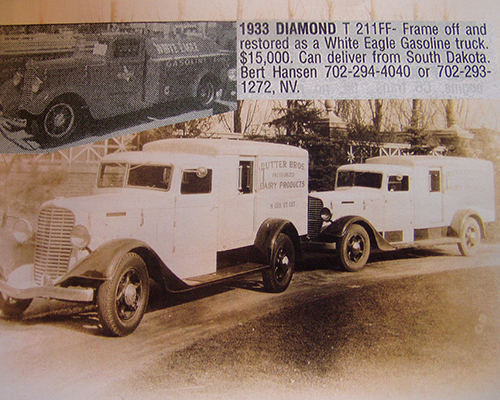 In 1934 they purchased their 2nd truck, which was a 1934 Diamond-T cab chassis. Again, they had York Hoover Body build and install this special style body on that truck. This style of truck & body was designed for two or three people to deliver milk at the same time. In those days the only refrigeration that homes had were ice boxes. Because of poor refrigeration in homes, milk was delivered 7 days a week, starting at 12:00 AM each day. There was a side door on each side of these bodies and a good size running board to stand on. There would be high school young men stand on each side of the truck and deliver the milk orders to each customer on their side of the street as the driver would tell them each customer’s order. When finished the boys would go home and get ready for school for the day. The driver would keep the books after each customer was served. The full milk cases were loaded and the empty bottle cases would be unloaded from the back doors of the truck.